Waller Creek is an important feature of the city, linking the UT campus to Lady Bird Lake through a meandering urban stream. Despite its potential as an ecological and recreational asset, the creek is a largely abandoned, prone to flooding, homeless encampments and pollution. We will be mapping the Creek to unfold its potential and help us think radically about design’s immediate and long term potential to transform urban settings. 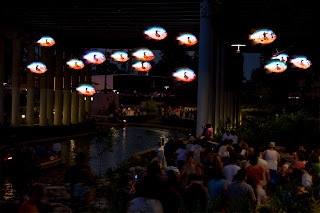 Phase II of the River Walk, which opened last year, included a number of public art installations on the newly-renovated 1.3 mile "Museum Reach" stretch, which connects downtown to the flood waters tunnel inlet just south of Brackenridge Park. Donald Lipski's F.I.S.H installation lights up the underside of the I-35 at night.